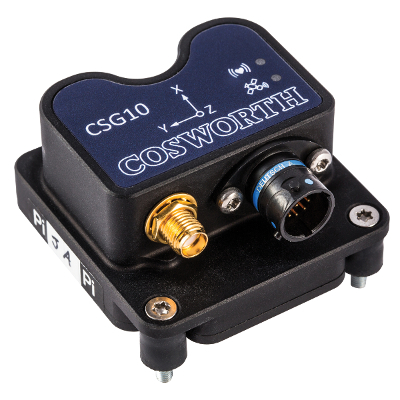 The CAN Serial GPS (CSG) is a new ultra compact unit that uses both GPS and GLONASS / BeiDou satellite arrays to deliver very high accuracy, low latency positioning information at up to 10Hz. Built into the unit is a user configurable 9 axis motion pack with adjustable range and filters with CAN update rates of up to 500Hz. Supporting both RS232 serial and CAN V2.0 simultaneously and combined with an input voltage range of 5-32V allows the CSG to be easily integrated to virtually any system. Dual band antenna connection is made with an SMA which allows the CSG unit to be mounted in a precise position inside the vehicle to offer unprecedented levels of measurement information. Ease of operation is achieved by incorporating LEDs to show satellite fix and processor heart beat. In addition a 15 day rechargeable internal battery allows the unit to hot start in less than 1 second. By default the CSG is ready to use advanced differential correction from WAAS EGNOS and SBAS messages allowing for an even greater level of positional accuracy to be achieved. The unit also supports a differential correction via an RTCM message, this requires the addition of a ground based basestation and a radio link to be implemented. SMA coupling nut mating torque between minimum 4lbf.in (0.5Nm) and 6lbf.in (0.7Nm) maximum.